Blizzard has unveiled its latest character that will be added to the Overwatch cast. Her name is Ana, and she sounds awesome. Ana is a sniper, and a support character. Her main weapon is a gun that heals allies, and also deals ongoing (i.e. poison) damage to enemies. She also has a grenade that does the same, and a pistol sidearm that can briefly knock out enemies (wow is that going to be irritating to try and combat). Her ultimate ability will power up her allies so they deal more damage, move faster, and are harder to kill. 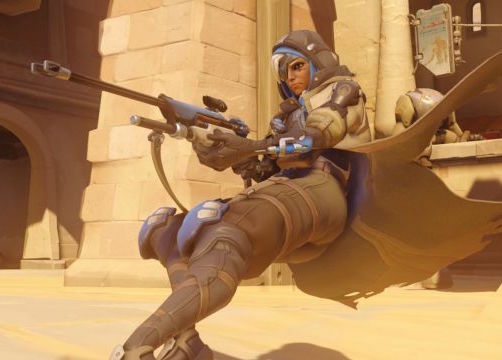 It sounds to us that Ana will be a very useful character for the leader personalities on teams. She'll be able to control the battlefield from a distance, and while she'll be relatively easy to defeat if she's caught alone, actually getting through the front lines to reach her might prove difficult. But, on the other hand, Overwatch is a fast game, and Ana is a sniper, so we'd expect that experienced players will enjoy her more than relative newcomers. Related reading: Matt's review of Overwatch. The origins video for her above. It's going to be interesting to see how the introduction of new characters affects the razor-sharp balance that has been so characteristic of Overwatch so far.